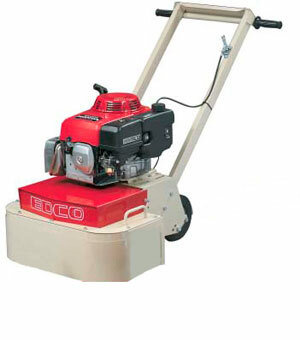 The Edco concrete floor grinder is a surface prep tool for concrete floors. Its two-head counter-rotating design makes it easy to grind in a straight line with having the slewing effect typical for floor polishers. It's powered by a 1.5HP electric motor which will run on 120 volts. The two large rubber tires in the rear allow for easier transporting and maneuvering on the work surface. This unit can be run as is or extra weight, such as a pair of concrete blocks, can be added if desired for more aggressive grinding action. This tool is excellent for removing surface coatings such as heavy paint accumulations, drywall mud splatter, buildups of printing press ink or machine tool oil, or anything that is just too much to be sanded. It can also be used to grind the surface of the concrete, although if you have much to do our High Speed Concrete Grinder is a better choice. 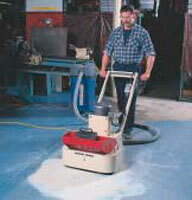 To achieve faster removal rates our Concrete Planer is an even faster way to go. The grinder is a hefty lift so it will take two men to unload it at your jobsite. It requires a 20 amp breaker to run it and water can be used if desired to help hold down dust, but it's not required. Overall Width: 27" Working Width: 22"